While the cars were lined up on the grid, Johnny Clark yelled over something to polesitter Mike Rowe that proved to be very ironic. “Take it easy on us less experienced drivers today!” Clark asked. As it turned out, it was the less experienced drivers that Mike Rowe should have been worrying about rather than the other way around. Rowe was quickest throughout much of the weekend at White Mountain by more than a tenth or two at times. That’s at a track where laps are in the 12-second range as well. Rowe and his SP2 team appeared to have the field covered. At the drop of the green, he showed how strong that he was by checking out on the field. But the tables turned on lap 60. 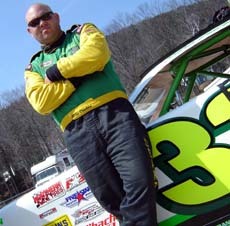 Rowe had already lapped some very good cars and drivers including Bobby Cabral and Corey Williams. He was going around the #72 of Oxford Plains Speedway (ME) champion Ricky Rolfe when the two cars made contact and went on synchronized spins through turn two. Rowe did not lose a lap, but had to drop to the rear of the field on the restart. He made it back to the top five, but his car was never the same and he finished fifth. “The car was awesome before that,” said Rowe. “Afterwards I couldn’t even step on it coming off the corner. I had to baby it the rest of the day. When I spun, I got back on it to get away from the traffic and I just brunt the right rear off it. Still, Rowe wasn’t too upset with a top-five finish to start the year. Since Rowe is the all time feature winner at Oxford, he is already a favorite to win the upcoming PASS race there on April 30th. On his way back to the lead pack, Mike Rowe got together with the #33 of Richie Dearborn while fighting for sixth. It happened going into turn three when the cars got together. Rowe dove underneath Dearborn, got him sideways and pushed him down the track like a snowplow before a caution was displayed. Dearborn kept his composure after the race when asked about the incident. This incident didn’t bring out any ill will between the two drivers involved. “No hard feelings,” said Dearborn. Another very fast car early on did not make it to the finish. Donnie Whitten was flying in his #83. He started sixth and was running a very solid race until he encountered an unusual problem. There were hard feelings though between Tracy Gordon and Cassius Clark after the race. Just before the 100-lap mark, Clark passed Gordon for second-place. The pass was a physical one and Gordon showed his displeasure by bumping Clark under caution a few laps later. Or maybe not. The two racers were sharing some shop space up until recently and now that appears to be a thing of the past. Clark also wanted to point out that he doesn’t think that he is a dirty driver. 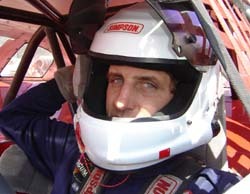 Clark went on to finish third and Gordon ended up seventh. The result for Gordon was better than one year ago when he broke a rear end and dropped out of the White Mountain race early on, but that was of little consolation to him after the race. “I’d rather be broken and out of the race then finish seventh like this and not be broken,” said Gordon. Another thing that Gordon would have liked to have would have been a chance to even things up in his mind. Clark didn’t think that he didn’t anything wrong. Early in the race, Clark showed restraint by not abusing his car and tires by racing everyone around him hard. Richie Dearborn won his first PASS race last season at Lee and has been quietly building himself into one of the top drivers on the tour. 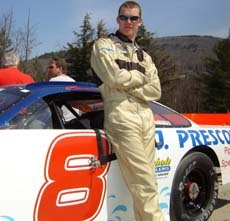 He left White Mountain with a sixth-place finish. It wasn’t what he wanted, but he’ll take it. Travis Benjamin and his #17 team showed some muscle at White Mountain. They were strong through all of the practice sessions and very quick in the race. Whitten did enjoy his time out front though. The PASS Modifieds were the opening act at White Mountain and they put on a good show. Wayne Allard spun early in the race, but motored back to take the victory ahead of Dana Grover and Richie Morse. And at least one driver agrees. Ben Rowe made a point to talk about Clark in victory lane. It seemed that the White Mountain race was tough on engines. Rick Martin loaded up early and was credited with 26th-place after breaking a motor in practice on Sunday. Eric Hudson only made one lap before pulling in with powerplant problems on his #02 and, while Scott Chubbuck last a little bit longer, he was still done in on lap 18. Benjamin did make some progress, but ran into a little trouble. “We got up to eighth and then got spun,” said Benjamin. “That put us to the back and by that point, we couldn’t race to the front again. 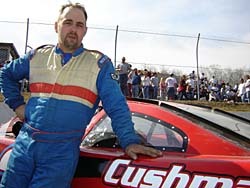 Chubbuck and car owner Jay Cushman both told Speed51.com before the race that they was worried about a problem with the head gasket, but that they would try to race anyways and monitor the situation. The start that the #29 had made a decision to pull out of the race very difficult. Benjamin’s young team is making a home on the PASS tour and he knows where they need to focus their attention on to get even better. Fresh off the 2004 PASS championship, Johnny Clark played the part of a title defender at White Mountain. He led laps and was never very far from the front all day before finishing fourth. As it turned out, Clark really didn’t have to baby his tires as much as he thought. Next, the PASS cars make a return to Oxford Plains Speedway, for the first time in two years. It’s the track where Clark got his start in racing and he’s looking forward to returning there. There were several notable absences from the season opening PASS race. The #34 car of Clinton Teague was not there. 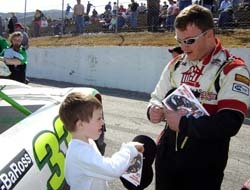 Its usual pilot, Teddy Christopher was in North Carolina for a NASCAR Whelen Southern Modified race. 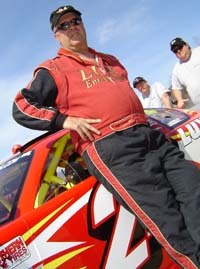 The #24 owned by Carlton Robie wasn’t there either. Travis Kheil was not at the Mountain with his car. He finished sixth in last season’s points race, but his #24k team has cut back to a limited schedule for this year. Kheil worked with Ben Rowe’s tire as the tire specialist for this race. Larry Gelinas also wasn’t there even though he was fourth in last season’s PASS standings. Also missing were Canada’s Dave Gorveatt and Sam Sessions, who has reportedly retired from racing.